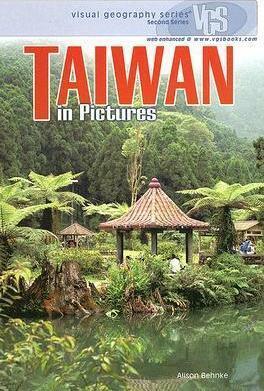 Taiwan has one of the highest concentrations of plants in Asia. 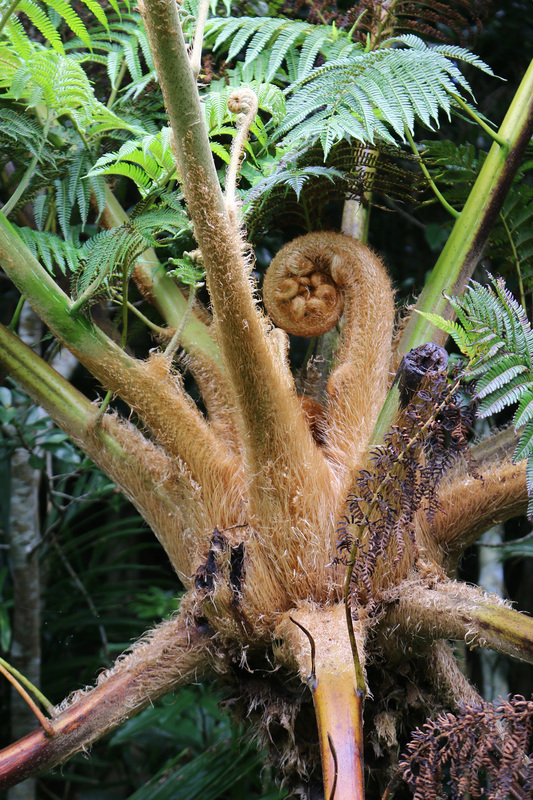 This is first and foremost a botanical expedition in search of ferns with the added interest of also being shown all of Taiwan's wild bananas and palms in natural habitats. If you have a special interest in a particular genus not already mentioned then talk to me, we can search for your specialist plants as well! I've been studying Taiwan plants for over 25 years, but there's a lot I don't know! PLEASE NOTE: This is an Expedition to Taiwan and therefore involves sleeping four interspersed nights in hammocks in wilderness locations and also some (optional) slightly more difficult hiking. (If you have a group I can arrange a bespoke Hotel Tour at a different time if you'd rather not sleep in hammocks). Nature Expeditions is the only tour operator in Taiwan offering overnights in the wilderness. 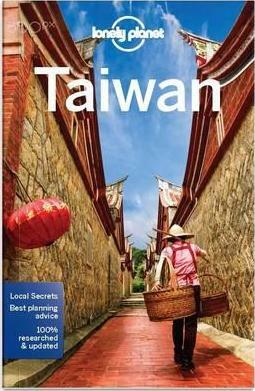 Fewer nights in hotels means this is also much less costly than other Taiwan tours. Also note the tiny group-size of only 6 people! 13 days, 12 nights (4 in hammocks). 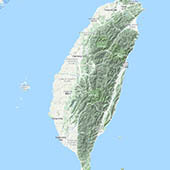 Taiwan lies 180 km off the southeastern coast of mainland China, a tobacco-leaf-shaped island approximately 400 km long by 120 km wide lying right on the Tropic of Cancer. The human population lives in only &frac13; of the western side of the island. The remaining &frac23; contains rather a lot of wilderness. The island has the largest number and density of high mountains in the world. There are 286 mountain summits over 3,000 metres (9,800 ft) above sea level. The mountains are this tall because, like the Himalayas they are very young and formed by being thrust-up from the sea-bed due to the Manilla plate crashing into China’s continental margin. The mountains are home to some quite spectacular animals like the Asiatic black bear, Chinese pangolin, Red and white giant flying squirrel, Yellow-throated marten, Masked palm civet, Leopard cat and the now thought to be extinct Formosan clouded leopard. 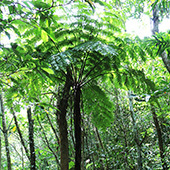 Taiwan is also a wonderland for botanists with new species being found every year. It’s difficult to know where to start with regards to the diverse plants of Taiwan, I’ve been studying them for over 20 years, but to use ferns for example Taiwan, with over 600 species of fern has more than any other place on the planet. 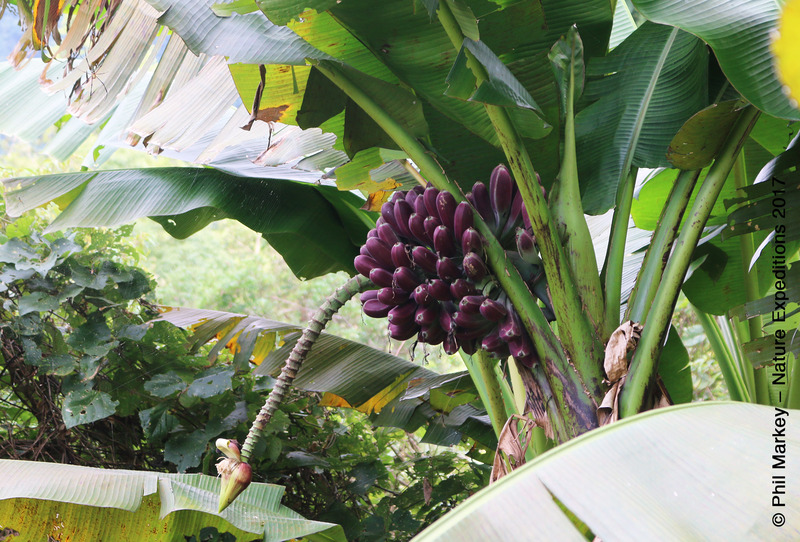 There are seven species of wild banana and we shall visit them all. 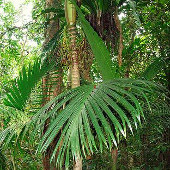 Regarding Taiwan palms, there are officially six (unofficially eight) native species, four of them endemic to Taiwan. We will see them all. Of-course Taiwan has many other types of plant which may be of interest to you. If you let me know what interests you we can go looking for those too. During the expedition we shall concentrate on the central mountain massif of Taiwan and Lanyu Island. To make the expedition easier we will try to spend, where possible alternate days in hammocks and hotels, which means you get to stay out in the wilderness to take full advantage of the evening and early morning for watching wildlife that most people never get to see, but the following night is in a comfortable hotel where you can freshen up. Arrive Taipei - International arrivals in Taipei land in Taoyuan airport which is 43 km from our hotel in Taipei City. There are regular buses to Taipei. I highly recommend arriving a day or so early to overcome any jet-lag you may have, but if you arrive on the day and if you arrive in the airport before 13:30 local time I can collect you from the airport as I pass through. The start time of the tour is 15:30 hours, meeting in the lobby of the hotel where we have brief introductions before taking a stroll through the Taipei Botanical Gardens before dusk when we will return for dinner. Accommodation: Comfortable city hotel with breakfast. Yangmingshan, then to Yilan lowland forest - We'll set off early in the morning after breakfast to drive up Yangmingshan. Yangmingshan is a small volcanic mountain north of Taipei approximately 805 meters above sea level and is famed for its smoking fumaroles, sulphur crystals, hot springs and spectacular landslide terrain formed by post-volcanic activity. 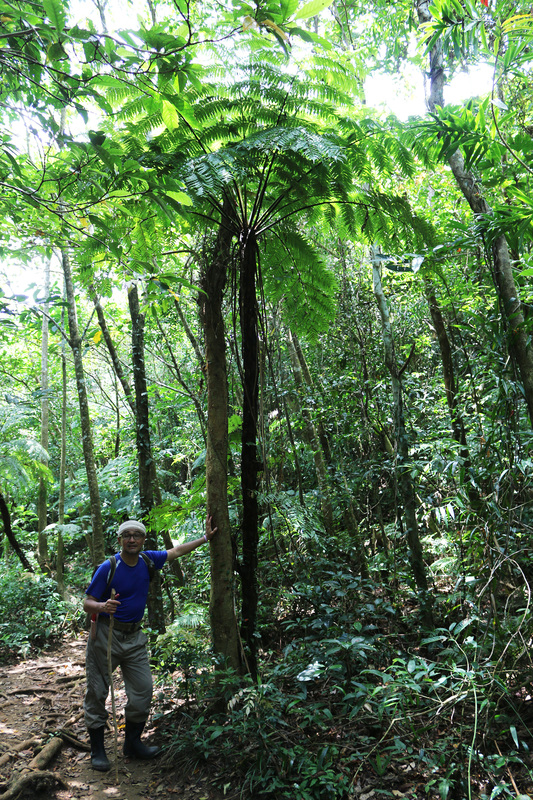 We're here to look for Isoetes taiwanensis, Cyathea hancockii and Cyathea metteniana. We then drive down the southeast to Yilan where we stop for lunch before making wild camp in hammocks in lowland forest, which is a good location for seeing Taiwan serow, the newly discovered Yilan banana Musa itinerans var. 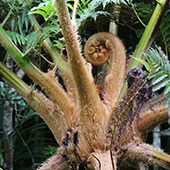 kavalanensis and a huge number of low elevation ferns including treeferns Cyathea lepifera, Cyathea spinulosa and Cyathea podophylla. 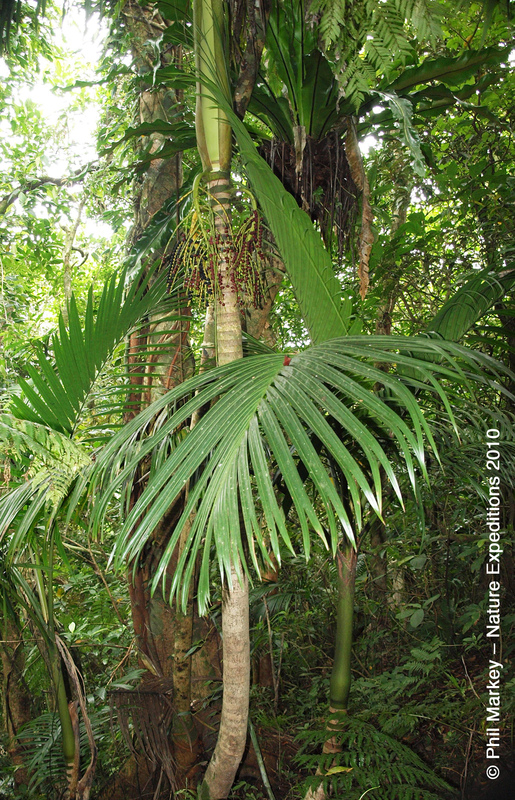 Other interesting plants include an enormous-leaved Tetrapanax papyrifer. Accommodation: 1 night in hammocks in lowland forest. Mountain driving with frequent stops then 2 nights at Dasyueshan - We will wake to the odd Taiwan serow walking through the forest. We have quite a long day's driving ahead. Not because it's a long way but because the road over the mountains is slow and winding. After we've made our own breakfasts we have time for a short walk before we set off. The first 74 km leg can be done in 2h 14 min., but we'll take longer due to frequent stopping to see what we can see. The next leg of the journey is a 2h dash down the freeway. Then the last leg is 36.3 km, 1h 15 min. (a good 2h for us), a tortuous ascent back up into the mountains to the Forest Recreation area of Dasyueshan at 2,250 m. Today, during the drive we will have seen the Arenga palm Arenga engleri and three more wild bananas Musa itinerans var. formosana, Musa itinerans var. chiumei and Musa itinerans var. chinensis. Now in the high and wet Dasyueshan forests we will be overwhelmed with the number of ferns to be seen. Accommodation: 2 nights in a forest lodge. Day of mountain driving then overnight at high elevation wilderness - The main cross-island road (Highway 8) across the centre of Taiwan is permanently closed due to earthquake damage which means we have a much longer detour to make via Nantou. So we have a choice this morning - stay in Dasyueshan for an hour or two to catch anything we may have missed or visit Sun Moon Lake in the very centre of Taiwan, or both! We will then proceed to drive over the central mountain spine of Taiwan at the Hehuan mountain pass, at 3275 m the highest road in East Asia. This is our first chance to look for high elevation alpine ferns. The objective is to spend a night in the hammocks at high altitude in the forest during the descent on the other side of the pass before heading down to the east coast tomorrow. Accommodation: 1 night in hammocks in highland forest. A slow day of mountain descent and coastal driving - Today, after what would have been a chilly night on the mountain we drop down to the east coast through the awesome marble cliff scenery of the Taroko Gorge to the hot and humid coastal lowlands where we will focus on the quite different east coast flora. Mountain bananas and Arenga palms grow at much lower elevation on the east coast, and Woodwardia prolifera is widespread. 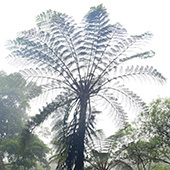 We may have time to hike to see the rare and prehistoric Cycad trees (Cycas taitungensis), and we will have by now seen the climbing rattan palm Calamus formosanus. Accommodation: 1 night in comfortable hotel. Catch the flight for one night on Lanyu Island - Our next destination will offer a striking contrast to what we have seen so far, the flora of the island of Lanyu is that of the Philippines, the climate is tropical and the island's facilities are not so well developed. 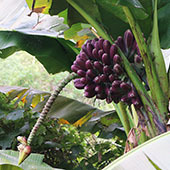 The island holds a series of special plants including Cyathea fenicis and the giant Angiopteris palmiformis ferns, but also the endemic Pinanga tashiroi palm and some interesting bananas. The 46 square kilometre island is 65 km east of the southern tip of Taiwan and about 110 km north of the Batan Islands of the Philippines. To get there requires a 20 minute flight on a small aircraft. You now have a choice of what to do. Most people who visit Lanyu stay close to the small road that encircles the island. Most of my botany work over the last 10 years has been in the steep forested interior of the island and you now have the opportunity to hike in to the rain-forest with me and sleep in hammocks for one night or stay in a guest house if you can't manage the reasonably difficult hike. The group can divide into those who want to hike in and those that don't. The main transport on the island is motor scooters, if you are able to ride one of these (they're not difficult) then bring along an international driving licence. It saves a lot of walking if some of us can ride and carry the others as pillion passengers. Like I said the hike into the jungle is steep and uncomfortable, I feel that anybody could do it if they are willing to push themselves a little. We have two choices of where I could take you in - the easier route is up to Tian-chi pond at about 300 m, the harder destination is to 552 m (the highest elevation on Lanyu) on Hong-tou mountain, where I can show you the orchids and the critically endangered Pinanga tashiroi palm tree endemic to the island and restricted at elevation. Please note, bad weather or military manoeuvres in the area could cause cancellation of the Lanyu portion of the tour. Accommodation: 1 night in hammocks or 1 night in simple guest houses. Return to mainland and head south - After returning to the mainland we will head for the south of Taiwan at Kenting, where we can hopefully recover from our tropical island excursions. Kenting is a popular Taiwan holiday destination. You might enjoy a stroll along the night market in the evening. Where we're staying is at the top of the hill in the botanical garden of the forestry research station. An interesting place to walk around. While in the far south we'll visit the southerly most point and see the wild date palm Phoenix loureiroi var. loureiroi. 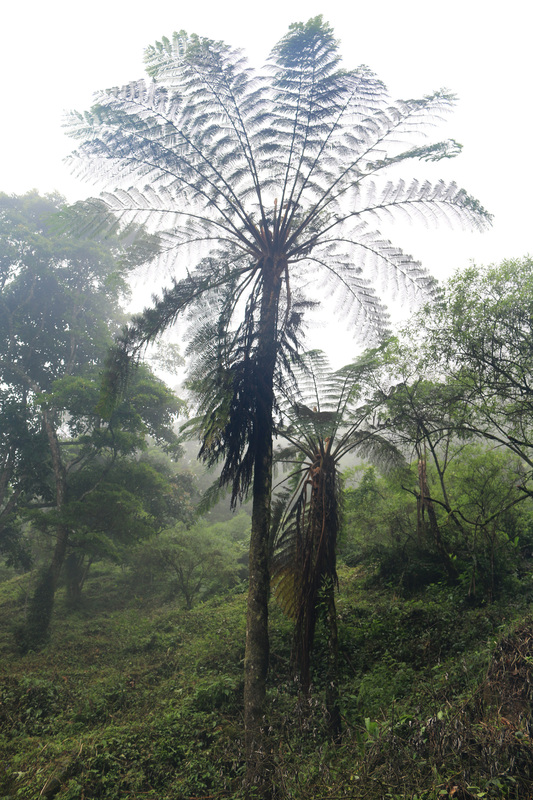 Back into the southern, drier mountains - The place I want to take you today is seldom ever visited by anyone, the cloud-forest here is the only place in Taiwan that the rare tree-fern Cyathea loheri can be found. To get there (if the road's open) we'll travel up through the drier forests of the south with spectacular views on the way. Accommodation: 1 night in hammocks. Visit Yushan National Park, the highest elevation of the tour - We will now head to the Tataka Recreation Area in Yushan National Park for additional high mountain specialities. On the way to Yushan we'll make a couple of little detours and stops, first to a lowland mud-volcano to see what plants we'll find in the lowlands, then a short hike into the low mountains to see Calamus beccarii. Yushan National Park is known as 'the ridge of the roof of Taiwan'. From here we will be able to see Yushan Peak, also called Jade Mountain, which, at 3952 metres, is the highest mountain in East Asia. Visit Xitou National Forest - This wet forest is home to a plethora of ferns, and also the area where the mountain banana Musa itinerans var. formosana occurs at its highest elevations in the conifer forests. Speciality ferns include Asplenium wilfordii, Colysis hemionitidea, Cyathea spinulosa, Cyathea podophylla, Angiopteris lygodifolia and many many more. Accommodation: 1 night in comfortable forest lodge. The last day of the tour, anything we can fit in before we depart - By late morning we will have to leave the high mountains and return to the lowlands and drive back north. We could visit the Taichung Botanical Gardens today. Depending on what time people have their flights out. Today we head back up to Taipei, passing Taoyuan airport on the way up. Some people might want to depart at this time. On return to Taipei the tour finally ends. Those who are staying in Taipei now depart. If anyone needs a lift to the airport I can drop them off as I pass by. How comfortable are the hammocks? I can tell you now they are far more comfortable than you might imagine. I find them more comfortable than my bed and most would agree. The only irritating thing is that tropical evenings are hot but in the middle of the night it turns cooler. You'll need a 3 season sleeping bag or quilt (not provided). If you bring a sleeping bag then you'll use it un-zipped as it is difficult to climb into when in a hammock, a feather down quilt is best. The hammocks are fitted with a mosquito cover, and have an independent fly-sheet. They have a foot-well for optimal comfort, and they even have a shelf to store your clothes and gadgets. You can sleep in almost any position even curled-up or on your front. You can't fall out of them. They're easy and fast to string-up and take-down, and very light weight. I'm sure you'll find them more comfortable and easy to use than you think. If you want to collect seeds and spore then you'll need to let me know in advance so that collecting permits can be arranged. Some species you will not be allowed to collect. For the most part we will eat traditional Chinese food in roadside restaurants (Chinese food is not the same as in the west), vegetarian restaurants are common and we can choose where we want to eat. We will also carry boil-in-the-bag meals to be eaten when in wilderness areas. Ensure you bring good quality footwear. I use a combination of walking shoes for driving and everyday use alongside strap-on sandals for other times. Day time temperatures can be as high as 35°C, but being a tropical island the humidity can be as high as 90% which can make it a very uncomfortable heat. Nights in the mountains can be cold and you should bring some warm clothes for when heeded. Bring one of those down-filled puffy jackets. It rains frequently in the mountains and the downpours can be torrential. Light clothing that is quick-drying is most suitable. An umbrella would be useful but don't bring plastic raincoats you will be wetter under the raincoat than if you didn't wear it. You'll need a change of clothes when camping out, typically you'll get wet through precipitation and perspiration when hiking through the rain-forest, it's nice to have fresh clothes to sleep in in the hammocks. 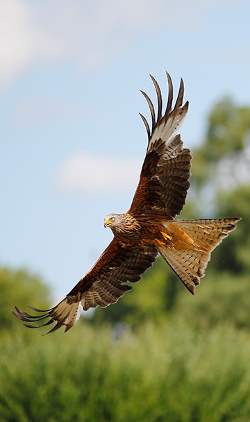 All Nature Expeditions' clients are entitled to 15&percnt; discount at Cotswold Outdoor & Snow+Rock. They both ship internationally. All over Taiwan mainland + Lanyu Island. Mostly (8) comfortable accommodations and (4) interspersed nights in hammocks in the wilderness. All vehicle & ferry transportation. Use of an insect-proof hammock tent. Use of sleeping bag/quilt for hammock sleeping. Moderate. Easy walking for the most part. 1 or 2 optional steep hikes.